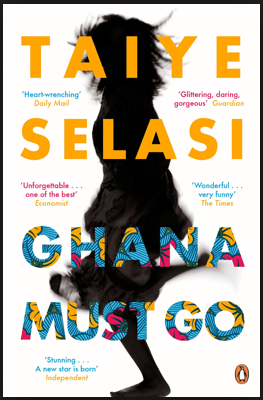 Taiye Selasi’s Ghana Must Go is not a page-turner. This isn’t necessarily a bad thing, sometimes it helps to take breaks while reading a book, it gives you the mental space to process the themes and concepts. That said, it took me over six months to finish this novel and I eventually did so not out of a compulsive desire to know the outcome, but out of obligation to my book club. The story opens when Kwaku Sai, once a feted Boston surgeon, suffers a heart attack in his garden in Accra. He dies alone, regretful of his estrangement from his family. His departure sends ripples across the country to Sade, the wife he abandoned decades before, and over the ocean to his four children in America. Slowly, his death reunites the disjointed family and exposes the issues that drove them apart. The writing is magnificent. Selasi explores family and love and guilt and forgiveness finding the words to ground intangible emotions and experiences. But is it too magnificent? Many a time I found myself marvelling over a descriptive passage only to realise it had pulled me from the story and driven off thoughts of the plot and characters. The pace of the narrative flagged under the weight of clever words and I found the prose kept me at arm’s length, always aware that a story was being woven before me. The main thrust of the narrative relies on the isolation of the family members, on people not communicating but instead nursing secrets and personal tragedies until they grow toxic. There is no extended family to act as mediator, peacekeeper, truth-sayer. No uncles, no aunts, no grandparents to knit the fractured family back together. Sade’s half brother makes an appearance but largely as a plot device. Otherwise this half-Ghanaian, half-Nigerian family exists in isolation, solitary, insular. For an African family, barely one generation removed from the continent, I found the loneliness of this family a tough sell. The individual characters were fascinating but inaccessible. I felt sympathy for the father who had let one mistake, a brief obsession, drive him from the people he loved most, but empathising with the cast of cold, ego-driven people was hard. Despite my difficulty connecting with Ghana Must Go, I will anticipate Selasi’s next novel as eagerly as I did this one. I think she’s an extraordinary writer and I’m sure the issues that made this novel an uphill climb for me will even out over time.